Hafnium atoms have 72 electrons and the shell structure is 2.8.18.32.10.2. The ground state electronic configuration of neutral hafnium is [Xe].4f14.5d2.6s2 and the term symbol of hafnium is 3F2. Hafnium: description Your user agent does not support the HTML5 Audio element. Most zirconium minerals contain 1 to 3% hafnium. Hafnium is a ductile metal with a brilliant silver lustre. Its properties are influenced considerably by the impurities of zirconium present. Of all the elements, zirconium and hafnium are two of the most difficult to separate. Hafnium is a Group 4 transition element. Because hafnium has a good absorption cross section for thermal neutrons (almost 600 times that of zirconium), has excellent mechanical properties, and is extremely corrosion resistant, it is used for nuclear reactor control rods. Hafnium carbide is the most refractory binary composition known, and the nitride is the most refractory metal nitride (m.p. 3310°C). 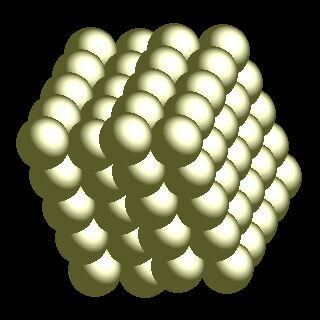 The solid state structure of hafnium is: bcc (body-centred cubic). Reactions of hafnium as the element with air, water, halogens, acids, and bases where known. Binary compounds with halogens (known as halides), oxygen (known as oxides), hydrogen (known as hydrides), and other compounds of hafnium where known. Bond strengths; lattice energies of hafnium halides, hydrides, oxides (where known); and reduction potentials where known. Hafnium was discovered by Dirk Coster and George Charles von Hevesy in 1923 at Denmark. Origin of name: from the Latin name "Hafnia" meaning "Copenhagen". 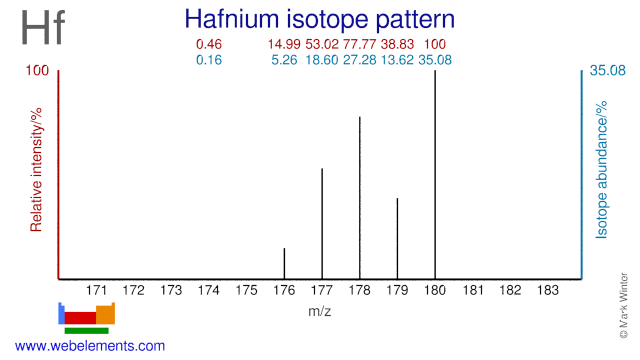 Isotope abundances of hafnium with the most intense signal set to 100%. 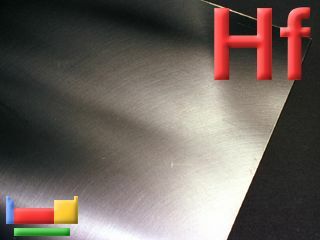 Hafnium isotopes have several applications. Hf-180 is used for the production of the radioisotope Hf-181 while Hf-180 is used for the production of the radioisotope Ta-179, which has a medical application. The second isomer of Hf-178 (Hf-178m2) exhibits a very high excitation energy and it has been suggested for use in gamma ray lasers. Isolation: hafnium extraction is always associated with its removal from zirconium as it is a contaminant of all zirconium minerals. Solvent extraction methods are used ot spearate the two metals but the process is not easy. These make use of the differential solubilities of the metal thiocyantes (thiocyanate is SCN-) in methyl isobutyl ketone.